A moratorium for the 2014 shrimp fishing season was announced for the US Northeastern Gulf of Maine shrimp fishery last week as stocks of shrimp for 2012 hit record lows. The last time the shrimp catch was halted was 35 years ago in 1977. Declining shrimp stocks became strikingly apparent in 2012, with the annual survey last year showing the lowest number of adult shrimp ever recorded in the survey’s 30 year history. Despite pressure to halt the 2013 season, fishing went ahead with a reduced catch limit of 625 tons, or a 72 percent decrease from the allowable catch set for 2012. 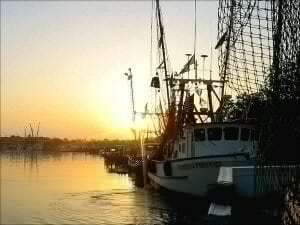 Even then, shrimpers only caught 307 tons for the 2013 season. Of particular concern is the fact that no juvenile shrimp have shown up in any of of the surveys since 2010. Shrimp in the Gulf of Maine live for only about five years so the lack of any young shrimp for the past three years portends trouble for the future of the fishery for many years to come. The sharp decline in shrimp in the region is largely attributed to overfishing and warming ocean waters. Even if shrimp prove heat tolerant, which shouldn’t be assumed, the warming oceans of the Gulf of Maine are deadly to tiny zooplankton, the shrimp’s principal food supply. Warmer water also make the region more hospitable to predators of shrimp like dogfish and red hake. Other species upon which the northeastern fisherman depend are also feeling the heat. The iconic lobster has been heading steadily northward in recent years in search of colder waters. For the shrimp, the future remains tenuous. At this point, nobody is confident that 2014 will be the end of the moratorium.